A lot of runners find the ultramarathon distance appealing. Especially if they are already running trails or are marathon finishers now itching for a new challenge. But ultras can be tough. And committing to your first is scary. After all, how do you even know if you’re ready to tackle such a distance and challenge? It’s a great question. One probably every ultrarunner asked him or herself before running their first ultra. So today I’ve put together a little tool I think will help you answer that question. 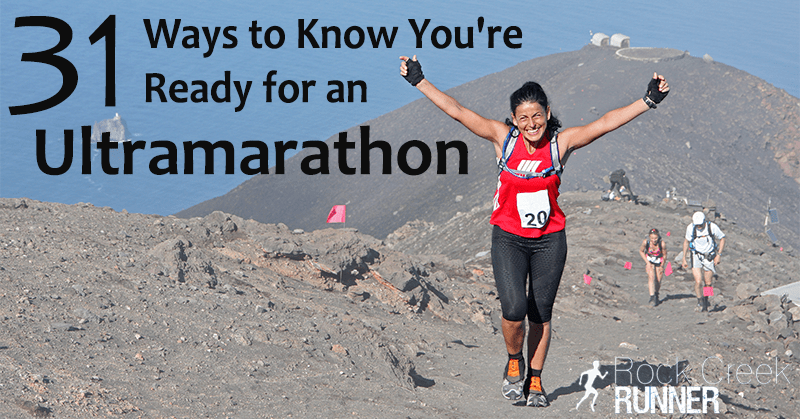 Below you’ll find a list of 31 possible ways to know if you’re ready to run an ultramarathon. Work your way through the list to see which apply to you and which do not. If just one applies to you, then I think you’re ready. Are You Ready to Run an Ultramarathon? 1) If losing a toe nail feels as natural as getting your hair cut, then you’re ready to run an ultramarathon. 2) If you’ve run a marathon, and are itching for a little more, then you’re ready to run an ultramarathon. 3) If you don’t mind being alone in the woods for hours at a time, then you’re ready to run an ultramarathon. 4) If you can eat an entire sandwich in the middle of your long run, then you’re ready to run an ultramarathon. 5) If you’re OK calling a hike/run combo a run, then you’re ready to run an ultramarathon. 6) If you don’t mind people calling you crazy every time you say what you’re training for, then you’re ready to run an ultramarathon. 7) If going to a dark place is part of what you’re after, then you’re ready to run an ultramarathon. 8) If blisters don’t scare you, then you’re ready to run an ultramarathon. 9) If you don’t mind running slow, then you’re ready to run an ultramarathon. 10) If the thought of running in some of the worst conditions imaginable is appealing to you, then you’re ready to run an ultramarathon. 11) If you have a beard, then you’re ready to run an ultramarathon. 12) If you’re ready to see exactly what you’re made of, then you’re ready to run an ultramarathon. 13) If you think you might have a friend that’s willing to run through the night with you and still call you their friend, then you’re ready to run an ultramarathon. 14) If traveling further is more important than traveling faster, then you’re ready to run an ultramarathon. 15)If you don’t mind starting a race before the sun comes up, then you’re ready to run an ultramarathon. 16) If eating 10 energy gels over the course of a few hours actually sounds kind of good, then you’re ready to run an ultramarathon. 17) If you’d prefer 10 miles on the trails over 3 miles on the road, then you’re ready to run an ultramarathon. 18) If wearing clown shoes, or at least running next to someone wearing clown shoes (like me, for example), doesn’t bother you, then you’re ready to run an ultramarathon. 19) If when looking for a route online you focus on multi-day backpacking routes instead of day-hikes, then you’re ready to run an ultramarathon. 20) If you don’t mind pooping in the woods, then you’re ready to run an ultramarathon. 21) If taking pills filled with salt seems logical, then you’re ready to run an ultramarathon. 22) If swapping stories and beers with your fellow runners in the finish-line area sounds like fun, then you’re ready to run an ultramarathon. 23) If trekking poles seem like a reasonable thing to carry on a run, then you’re ready to run an ultramarathon. 24) If running through the night doesn’t make you scared of monsters, then you’re ready to run an ultramarathon. 25) If you know who Kilian Jornet is, then you’re ready to run an ultramarathon. 26) If the thought of running further than most people can drive without taking a pit-stop appeals to you, then you’re ready to run an ultramarathon. 27) If you don’t mind “hitting the wall” multiple times in a single race, then you’re ready to run an ultramarathon. 28) If you’re willing to call Coke a sports drink, then you’re ready to run an ultramarathon. 29) If you’re willing to read a list this long, then you’re ready to run an ultramarathon. 30) If you’re ready for a life changing experience, then you’re ready to run an ultramarathon. 31) If you want to run an ultramarathon, then you’re ready to run an ultramarathon. If you want it, then you’re ready. I’m a firm believer that anyone who wants to can run an ultramarathon, they just need to know how and where to start. I so very clearly remember how terrified I was to register for my first 50k. Anything beyond 26.2 seemed like this foreign place few wanted to visit…and even fewer survived. But in reality, that’s not the case. Trail and ultrarunning is the fastest growing sub-group of runners, and for good reason: Ultrarunning will change your life. It most certainly did mine. So what are you waiting for? Check out the Trail Runner’s System here. Through video, audio, and expert interviews, the Trail Runner’s System is designed to help you transition to trails and ultras from where you are now. Regardless of ability. If you solve most of your life’s problems in a single run…. You’re ready for an ultra marathon.